Especially since 2006, the European Union (EU) has been producing several documents addressing gender equality, such as annual progress reports, working papers, or even brochures. In addition to these, the document presented here allows us to follow the strategy on gender equality set out by the European Commission and carried out by member states, following the pattern left by the first strategic plan (2010-2015). Based on five key areas for action, the document presents in detail the priorities, targets and future actions for the five years ahead. In ‘Integrating Gender’, Hoskyns (1996) explores EU’s policy on women’s rights and equality, from the Treaty of Rome (1957) to the Treaty on European Union (1992). The author delivers a combined approach between International Relations and Feminism to criticize the lack of action via EU’s institutions. Due to the topics addressed, this book was an important starting point for further feminist analyses of the history and procedures carried out by the Union. In addition, it throws a significant light on the role that activism and women’s organizations can have on gender equality progresses. The article follows the widening of EU’s agenda regarding equal opportunities for men and women during the 1990s. The authors seek to understand the inclusion of positive actions towards women and gender-mainstreaming in EU’s policy process, features that are far removed from the until then traditional economic emphasis (e.g. equal pay). Given this, Pollack & Harfner-Burton (2000) analyse institutional and political aspects to elucidate EU’s new approach and policy frame. This book addresses, in an extensive sense, the emergence of gender as relevant topic on EU agenda. Kantola (2010) takes into consideration the role of diverse actors and discourses at different levels of power decision-making (local, regional, national, and EU levels) that fuel gender inequality situations. The author highlights not only specific strategies on gender equality, but goes further in identifying gender dimensions in other policies. Despite its introductory nature, this 2013 text enters this list by giving the starting point to ‘Women’s Studies International Forum’ special issue. With that said, MacRae (2013) contextualizes the next articles exposing the main criticisms about gender-mainstreaming, and exploring the relation between gender equality strategies and their applicability through EU’s institutions. In this way, it is worth noting not only this article but the others that, in a generic way, critically highlight the progresses and setbacks in gender issues at EU’s institutions and policy procedures. Despite recognizing some advances for women in Europe, Lombardo (2003) explores the obstacles in achieving gender equality in a patriarchal system reflected in EU’s gender strategies and policies. The centre of her analysis is the ‘Wollstonecraft Dilemma’ that denounces the difficulties behind the attempt to achieve full citizenship by women, presenting two paths that are “incompatible within the confines of the patriarchal”. Given this, the author analysis empirical evidence from Spain, based on a more holistic methodology, to prove that the Union’s gender policy continues to be caught up in this impasse. This 2009 article scrutiny the swing on “equal rights discourse that started to revolve around gender issues”. Gerhards et al. (2009) present two theoretical explanations for this shift, one related to endogenous factors (e.g. a move from a materialistic logic to an emphasis on post-materialist values) and the other to exogenous aspects (e.g. the impact of globalization) linked to the country being analysed. In this sense, through the empirical analysis of attitudes towards gender equality by EU’s and Turkish (candidate country) citizens, the authors attempt to explain whether differences in values “can be traced back to endogenous or exogenous factors”. Kunz & Maisenbacher (2017) centre their analysis on situating the promotion of women’s rights and gender equality on neighbouring countries, a key element in the New European Neighbourhood Policy (NENP), within a broader debate concerning European identity formation and the relation with ‘Others’. That said, this 2017 article combines two sets of literature, one being feminist and the other being postcolonial. Over a contrapuntal logic, the authors analyse both the official EU documents as well as the ‘voices’ expressed through the new social media (e.g. blogs, videos, Twitter), to highlight different aspects of the narrative carried out by the EU within the NENP. This study, supported by ILGA-Europe, draws attention to transgender human rights and to experiences of hate crime affecting transgender people in EU, providing an empirical and extensive analysis of this situations throughout the member states. Given this, Turner’s (2009) work enters this list by its approach but also by the topic that puts in the centre of his analysis, often left out in the literature when studying gender issues. Former member of the European Parliament, Joke Swiebel examines the international path and strategy of lesbian, gay, bisexual and transgender (LGBT) movement. Throughout the article, the author situates the fight for LGBT human rights at EU and United Nations (UN) agenda, scrutinising their different outcomes. Swiebel (2009) lends great importance to the role ILGA and ILGA-Europe play in the promotion of the international agenda on gender issues, which go beyond promoting equality between men and women. 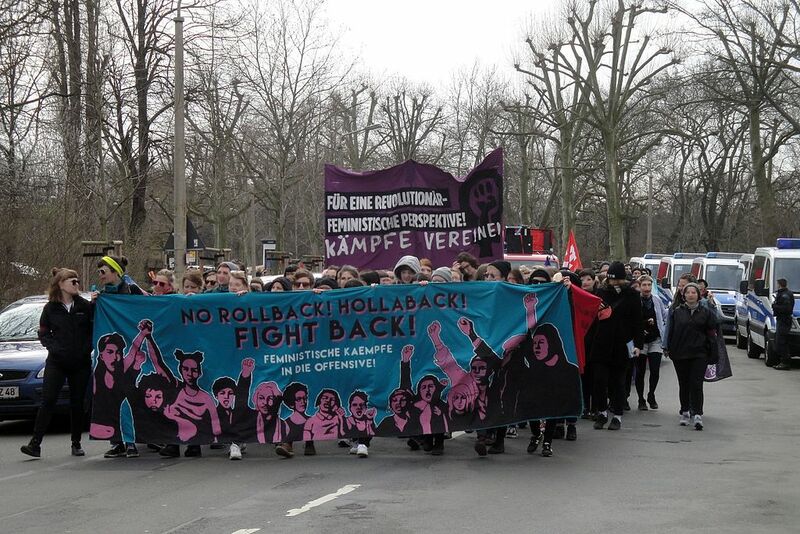 Demonstration in Leipzig, 2017. Photo by Reise Reise, CC BY-SA 4.0. Student at the Master in International Studies (ISCTE-IUL). Undergraduate degree in Political Science (ISCTE-IUL).